Dominic Breazeale is "definitely open to negotiations" for a Dillian Whyte fight after the British heavyweight turned down an initial offer from Anthony Joshua. 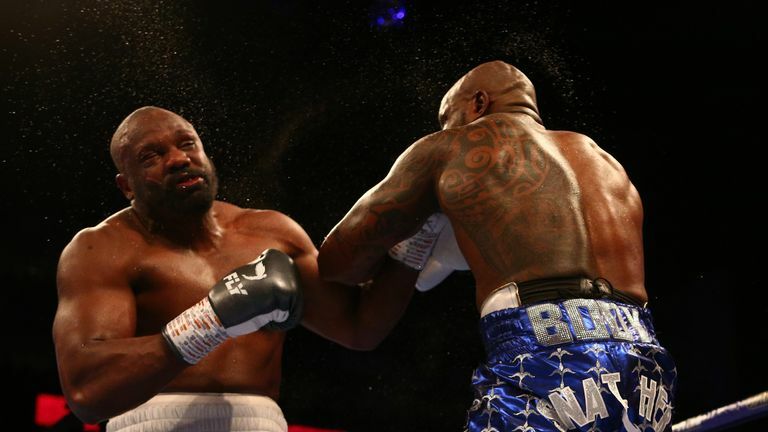 Talks between Breazeale and Whyte were held last year, but the duo were unable to agree terms, and the Californian went on to defeat Carlos Negron in December, while the Brixton man stopped Derek Chisora in a rematch on the same night. Whyte has flown out to attend the Manny Pacquiao-Adrien Broner fight in Las Vegas after turning down an opening offer for a Wembley rematch with Joshua on April 13, and Breazeale has welcomed fresh discussions about a high stakes clash between the two highly-ranked WBC challengers. "I hope he does make some type of deal with the PBC, if not some type of a deal with the personnel that's around for me and him making a fight," Breazeale told Sky Sports. "People have talked about it for a while. I am a fan-pleasing type of guy, so if that's what the fans want to see, I'm all for it. "At the same time, I'm not going to pass up opportunities to fight for the WBC title, to go down there to fight Dillian Whyte. I hope he does make some type of a deal. He can come here to the United States and he can get all he wants of Dominic Breazeale." Breazeale is mandatory challenger to WBC champion Deontay Wilder, who must firstly face Tyson Fury in a rematch, while Whyte is the WBC's No 1 ranked challenger. As he waits for the Wilder fight, Breazeale intends to return in April, and hopes Whyte would agree to another fight in America after he halted Malcolm Tann on a trip to Nebraska in 2017. I know we started the early part of last year with negotiations and I have no problem picking back up again and getting back underway. "I would definitely be open to negotiations," said Breazeale. "I know we started the early part of last year with negotiations and I have no problem picking back up again and getting back under way." Referring to a US fight, he added: "That would be great. That would be right in line. He would be on schedule for everything. All we've got to do is pick a venue, and pick a date, and let's get it rocking and rolling." Whyte has accepted the challenge from Breazeale, insisting he should find it 'easy' to finalise the bout. Let's do it, end of April, or early May. "I definitely want to fight Breazeale," Whyte told Sky Sports. "It doesn't need to be PBC, it can be Matchroom and Sky Sports. If he wants to fight, we can fight. It's an easy fight to make, let's make it. Let's do it, end of April, or early May. "I will fight him in America, but what can he offer me to come to America? I'll offer him more to come to the UK." If a battle between two of the WBC's top five fighters is held, Breazeale believes the addition of a belt such as the WBC interim title would be a fitting reward for both men. "I think it would be a realistic type of a situation, him being the WBC 'silver' heavyweight champ, and me being the WBC mandatory," he said. "I think he should gamble and I should gamble, we should throw it all on the line and let the best man win." Asked about the WBC interim belt, Whyte added: "Perfect. That works for me, that's fine, but I don't need a belt to fight Dominic Breazeale. If he wants it, he can get it."